Pure Voca review | What Hi-Fi? Pure’s Voca looks and feels like a quality product. The wrap-around aluminium case, complete with brushed-metal effect, sets it apart from the ‘plastic-fantastic brigade’ at this money. Even the matt-finish buttons on top feel pleasant and respond with a satisfying click. The speaker has a decent-sized footprint so it’s stable and doesn’t skid across a desktop (no balancing act needed here). Our only disappointment lies with the rubber base stuck on the underside of the speaker. On our sample it was fitted skew-whiff and this small detail took the shine off our otherwise-pleasant introduction. We hope other samples do not have the same problem. The Voca has a pretty ordinary features list. There’s a 3.5mm input and an integrated mic for taking calls. It’s charged using a normal power supply instead of micro-USB. Bluetooth support doesn’t include aptX (but that isn’t necessarily the end of the world), and there’s no NFC for pairing devices. Battery life comes in at a claimed 10 hours. Play 50 Cent’s Winners Circle and the Voca starts on the front foot. Highs sound relatively sweet and refined for a product of this type, while Fiddy’s vocal shows decent texture and detail. 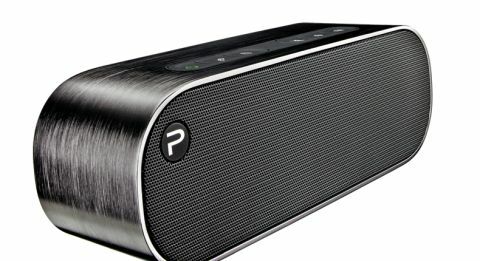 There’s a clear step up in finesse and refinement compared with the likes of the Yamaha NX-P100 and Jawbone Mini Jambox. The built-in subwoofer brings fullness and richness to the bass, but it does have a bad habit of stepping over the line. Spin Iggy Azalea’s My World, where the bass notes come thick and fast, and the Pure trips itself up. Each note is over-egged and as the track tries to move forward you find the bass lags behind the rest of the music. If you are willing to sacrifice bass weight, you will find greater clarity listening to the Roberts Travel Pad and more cohesiveness through the Philips BT3500B. The Voca does a lot of things right, but in the end that troublesome bass dampens some of our initial enthusiasm.